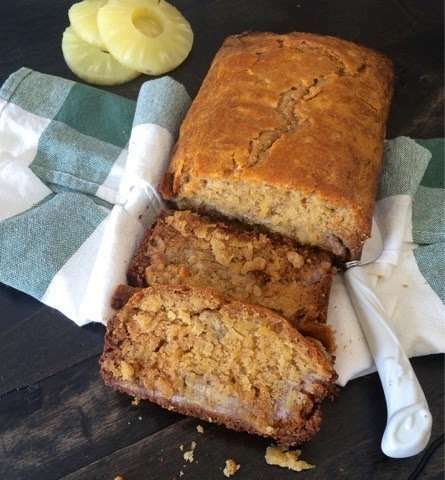 This loaf is a wonderful tropical twist to the traditional banana loaf. No sugar is added, instead, it is sweetened with natural honey. The pineapple and yogurt make this loaf moist and delicious! 1. Preheat oven to 350F (180C). Spray a 9 x 5 loaf pan with nonstick spray or line the pan with parchment paper. Ensure parchment paper is over hanging so you can easily lift the loaf out. 2. Mix together flour, baking powder, baking soda, cinnamon and salt. Set aside. 3. In a separate large bowl, cream the butter and ¾ of honey. Beat in eggs one at a time and then add yogurt and vanilla.Mix well with a spatula. 4. Add the flour mixture and mix well until all ingredients are incorporated. 5. Pour into a greased 9 x 5 inch loaf pan. Bake for about 35 – 45 minutes, until risen, golden brown, and a toothpick inserted in the center comes out clean. 1. In a small heavy bottom sauce pan, add the reserved pineapple juice and a ¼ cup honey. Simmer for 5 – 6 minutes until glaze thickens. Let cool.